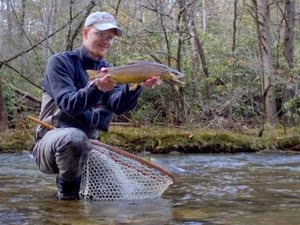 In the Smokies, a blizzard hatch is probably a little different from one in more nutrient-rich waters. Still, from time to time the stars will align and the bugs will pour off the water all at once. Yesterday was such a day and I was fortunate enough to be there to enjoy the event. I drove up to the Smokies planning to enjoy the last few hours of Troutfest but also planned on fishing. Driving into Townsend I noticed that LR was up and muddy. 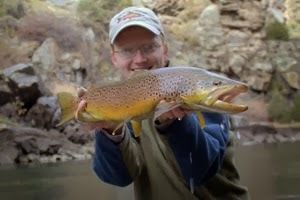 Thoughts of big browns were soon roaming through my head but I decided to check out Troutfest first. That proved to be an excellent choice. I got to meet a lot of great tiers but the pinnacle was watching Joe Humphreys do his casting seminar. I learned a lot of great stuff watching a true master who is also blessed with the ability to teach! After the seminar, I headed over to LRO to pick up some stuff I've been needing and then drove up LR road to look for some good fishing. The first few places I stopped all had a few scattered bugs coming off but nothing special. The water was very high and I tried to avoid wading as much as possible. 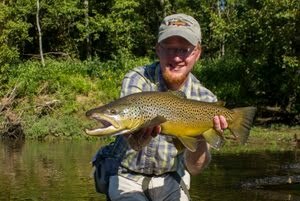 Chucking big nymphs and streamers was the order of the day until my 3rd or 4th stop. The pool is one of the better known ones on Little River and is known for producing good fish. I was hoping to find a large brown out looking for a big meal. 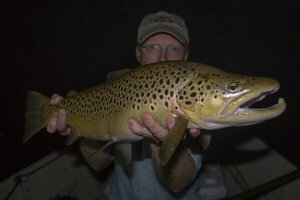 As I ran my streamer through the pool, I couldn't help but notice that the bugs were quickly becoming thicker and despite the high, stained water, the fish were rising enthusiastically for the banquet. I ran back up to the car and grabbed my dry fly box and a new leader and hurried back. The surface activity was better than before and I had a hard time tying everything on and watching all the fish rising at the same time. Finally I had a parachute light cahill and started casting. I tried to remember the tips that Joe had talked about. The tricky currents required a lot of slack in both the line and leader or a reach cast with slack in the leader. Most of the fish were rising on the far side of the pool right along the current seam and into the softer water. This made getting a good drift difficult but I started getting it figured out and the fish responded. Naturally the best activity was impossible to get to with the high water. If I had my waders with me I probably would have attempted a suicidal stream crossing because the fish on the far side under the overhanging trees looked a lot bigger than the 7-10 inch fish I was catching. Fully satisfied with the fishing, I decided to do some exploring...well, kind of anyway... 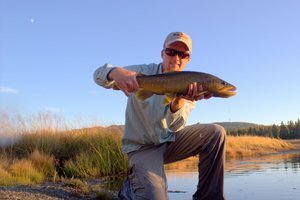 I went up to another popular pool to see if the hatch was as good. You really get some great catches, I haven't been out and about, fishing wise, really have to get out there again, but with winter here now its just a bit too cold. Those are some beautiful trout. Just came across your blog and wanted to say Hi. I've added you to my blog roll and will visit regularly. Remember: "A bad day fishing is better than any day at work".